I spoke for a few minutes today at the memorial for my grandfather, Art Dillingham. He died on Saturday, at 87 years old. The following are my notes. Though I didn't read them verbatim, they'll give you a pretty good idea of what I said. I went into this thinking that this wasn't a terribly big deal. We'd all seen this day coming for the last few years, and we all knew that it was for the best. The vibrant, loving and funny man that was my grandfather had been hollowed out and reduced by Alzheimer’s. Yet, the simple truth is that we all loved him. I loved him, very much. He could be a hard man at times, but he was always there when we needed him and he always wanted to spend time with us. My aunt Ellyn asked me to send memories to uncle Dave for this memorial, and I thought it would be easy. We’d been prepared for this for years. Right? Sure. Just like watching a bee fly at you across the yard means it won’t hurt when it finally catches and stings you. Right? Anyway, you don’t want to hear my rambling. This is a memorial, so let me tell you about a few of the memories I have of my grampa, and a couple lessons I learned from him. I do need to warn you, though, that while I know I inherited some of my grandfather’s quirks and qualities, excellence of story telling is probably not one of them. We were living in New Hampshire in the mid-80's. 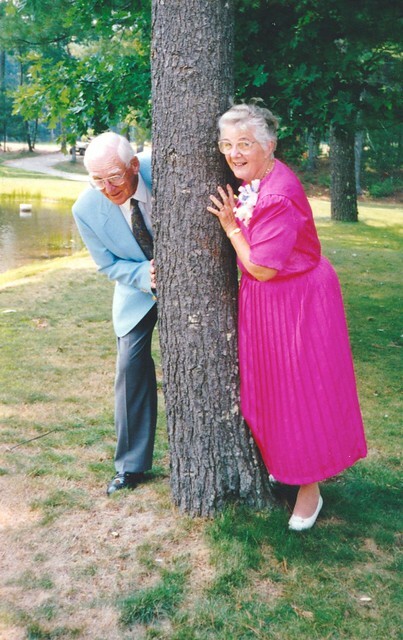 Every summer, Gramma and Grampa would come to visit for at least a couple of weeks in their motor home. When I was 13 (meaning Grampa was 58), he took me and my brother Jed hiking up Mount Monadnock (which we could see from our back yard). At the top he sat down and pulled off his shoes. At first I thought that was an odd thing to do. Then I saw his foot: he had a broken toe which was purple and bent out of shape! He admitted it hurt, as he'd just broken it within the last couple days, but he reassured me that he had a "high tolerance for pain," and that the discomfort was worth it for the chance to spend the day with Jed and I.
I'm not being corny or exaggerating when I say this taught me — or at least reinforced — a couple of lessons. First lesson: We will suffer, gladly, for the things and people we truly love. To be with them, to support them, to be a part of their lives or to be a part of something greater than ourselves: these things are worth our pain and we'll never count the cost. I didn't fully understand that lesson then — and I’m still coming to grips with it now — but his deep desire to be with us in spite of his pain rang in my mind like a bell whose echo I still hear 29 years later. Whenever I feel the need to be with or help someone I love and yet I know there’s going to be hurting, or something at the ecclesia causes hurt and heartache… I’m reminded of his broken toe. The lesson wasn’t that we need to struggle through in being with and helping one another in spite of our pain and discomfort. It’s that if we truly love someone or something, any pain and discomfort is irrelevant and not worth counting. Second lesson: Climbing a mountain at 58 years old with two kids and a broken toe!? My grandfather was some kind of super hero. For the next few years the Eastern Christadelphian Bible School would be held right down the street from our house in New Hampshire, at Franklin Pierce College. For a number of those years (maybe all of them? ), Grampa led or at least participated in a hike up the mountain… and I'm sure many of the people here at this memorial were on at least one of those hikes with him. I think even Harry Tenant went once, which probably made the bible school committee a little crazy. As a kid I was a thumb sucker. This bothered Grampa. I'm sure now that part of the problem was my height: I was so much taller than other kids that I looked older, so it seemed like I was still doing this "toddler thing" too late. His second idea, and the one which actually worked, was to wrap both of my thumbs in black electrical tape. All it took was a couple of days and I was cured! In 1981, Grampa bought me my first computer. Ever since, he liked to tell the story about walking into our house a few days later and seeing some little program I'd written which moved colored bars around on the screen and played sounds at the same time. His pleasure at what I'd done contributed greatly to my career with computers. Years later, whenever he'd ask me to explain what I was working on, he'd be satisfied to know that it basically boiled down to putting pictures on the screen and making sounds coming out of the speakers, just like I did as a kid. 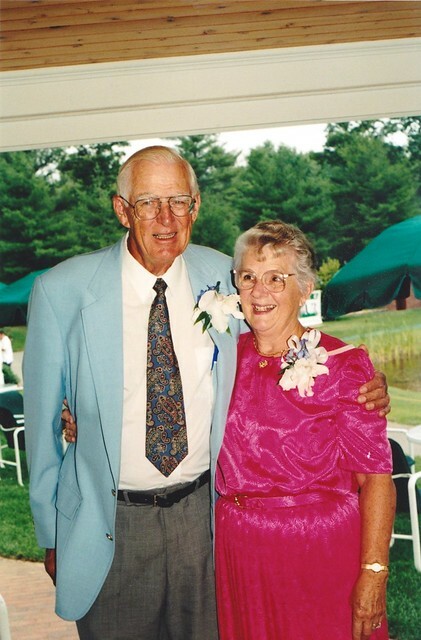 Uncle Roy (his mother's brother) and Aunt Marion Farnum were incredibly important to Grampa. In 1980, they were living in FL and were moving to a new place. Grampa, my Dad, my brother and I drove down to Florida to help her move and get her settled. Jed was 6 and I was 8, so we weren't going to be much help. Was there a lesson from this trip to Florida? Yes, but it's not one that could have been explained to me in words. It's something he and my Dad wanted us to learn by example, and it's related to the lesson from Mount Monadnock. We sacrifice out of love, not because we have to but because we want to. Also, it's possible to give until it hurts and yet find so much joy and even fun in the act of giving that the pain is easily forgotten. I was in Grampa's bedroom once as a little boy for some reason or another (just following him around), and he was fetching his wallet from his bureau. A picture fell to the floor. I picked it up for him, and was surprised to see it was of a pretty lady I didn't know. "Who's that?," I asked. "That is the most beautiful woman I've ever seen," he answered with a twinkle in his eye. Now jump ahead 30 years, to just a few years ago. Grampa had largely lost the fight against Alzheimer’s, and didn’t recognize me anymore — or when he did, he thought I was my dad. (Or his brother John.) Gary picked him up one Sunday morning and brought him to meeting (aka “church”), and I tried to help him find a seat. He didn't recognize me or anyone else this particular morning, but he pointed up toward the front left of the hall and said, "She's pretty, I'll sit with her." The man was an unashamed (and harmless) flirt, as most already know. But imagine the sense of wonder (and perhaps a little relief) I felt that Sunday morning to see he was pointing to the woman he'd married so many decades earlier, my Grandma. My Grampa was one of the most social men I’ve ever known. He had his serious side, of course, but he truly loved people, finding something in common even with the random total stranger, and making everyone around him smile and laugh. If you can remember him with a smile and shared his hope to see him again someday soon… well, I think that’s all he’d want of any of us.